Besides last year’s Bishop Hill post discussed below, another blog account of the “Hockey Stick” thesis that merits excerpting is at JoNova. I do this despite my finding its tone a bit overheated and its generalizations not being adequately qualified. Substantively, I disagree with its treatment of the evidence in favor of the Medieval Warming Period being warmer than the 1990s as if it were well established by scientific evidence. Even Steven McIntyre, who debunked the Hockey Stick, is generally careful not to assert that as fact. Because of sampling problems and statistical issues, McIntyre views the state of the evidence as insufficient to establish with adequate certainty which period was warmer. Nonetheless, the substantial evidence that the Medieval period was indeed warmer grows every year. In 1995 everyone agreed the world was warmer in medieval times, but CO2 was low then and that didn’t fit with climate models. 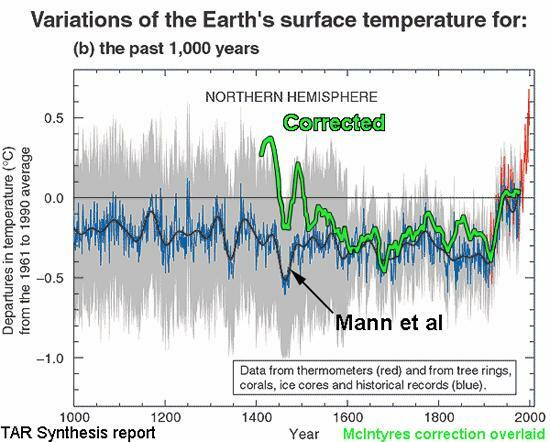 In 1998, suddenly Michael Mann ignored the other studies and produced a graph that scared the world — tree rings show the “1990’s was the hottest decade for a thousand years”. Now temperatures exactly “fit” the rise in carbon! The IPCC used the graph all over their 2001 report. Government departments copied it. The media told everyone. But Steven McIntyre was suspicious. He wanted to verify it, yet Mann repeatedly refused to provide his data or methods — normally a basic requirement of any scientific paper. It took legal action to get the information that should have been freely available. Within days McIntyre showed that the statistics were so flawed that you could feed in random data, and still make the same hockey stick shape nine times out of ten. Mann had left out some tree rings he said he’d included. If someone did a graph like this in a stock prospectus, they would be jailed. Astonishingly, Nature refused to publish the correction. It was published elsewhere, and backed up by the Wegman Report, an independent committee of statistical experts. In 2009 McIntyre did it again with Briffa’s Hockey Stick. After asking and waiting three years for the data, it took just three days to expose it too as baseless. For nine years Briffa had concealed that he only had 12 trees in the sample from 1990 onwards, and that one freakish tree virtually transformed the graph. When McIntyre graphed another 34 trees from the same region of Russia, there was no Hockey Stick. The sharp upward swing of the graph was due to one single tree in Yamal. Skeptical scientists have literally hundreds of samples. Unskeptical scientists have one tree in Yamal, and a few flawed bristlecones . . . . The Briffa reconstruction mentioned is the one that prompted the “hide the decline” comment. Post-1960 tree-ring data was deleted because it did not match the temperature data, a discrepancy that both created an impression of warming rather than cooling and called into question the use of those tree rings in the first place.